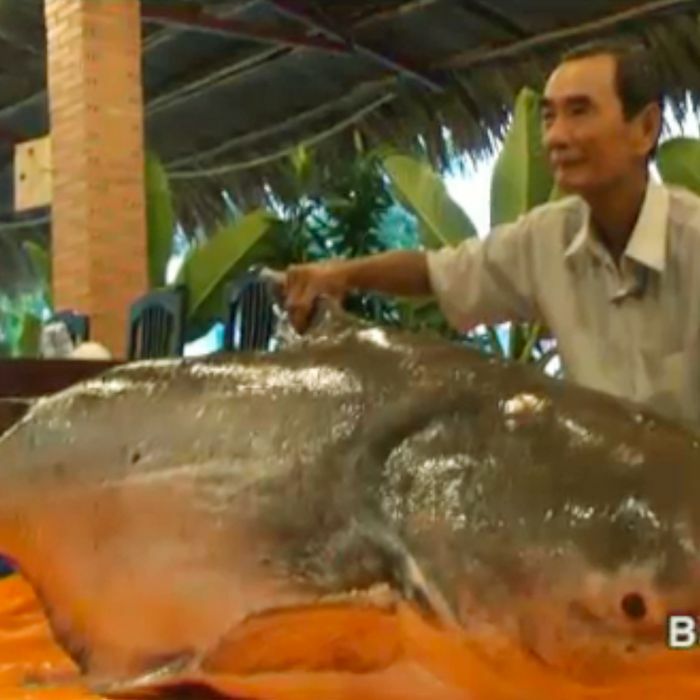 Some enterprising restaurateur in Ho Chi Minh City just became the proud owner of this 500-pound Mekong giant catfish. Serving it is actually illegal in Cambodia and highly frowned upon in Vietnam, and that’s probably part of the reason it cost the guy $16,000, which probably includes shift pay for the 10 dudes who lifted the carcass out of the delivery truck and onto ice. This particular kind of catfish is reportedly the world’s largest freshwater species, basically a river shark that has clocked in at a “grizzly bear-sized” 646 pounds. The IUCN Red List also rates it as critically endangered, putting its hulking filets merely one threat level shy of dodo bird omelettes. On the plus side, it seems like everyone loves taking dead endangered catfish selfies.